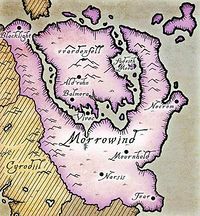 Tear is located on the southeastern peninsula of the province of Morrowind, near the border to the province of Black Marsh. The land surrounding Tear is harsh, consisting of damped swamps and scorching sun, overall a rather industrious and unforgiving environment, in a dividing point between Deshaan and Black Marsh. Because House Dres operates in Tear, the land consists of Saltrice and Lichen plantations, where various slaves are working on the clock. [UOL 1] Even as far south as Tear, the land is shrouded in red skies. In Tear plantations, the Dres Slavers utilize large insects. It is largely speculated that the Clockwork City is located in the southern swamps near Tear and the southern borderlands. [UOL 2] Tear is neighbored by several settlements, including Corkarth Run in the north, and Silnim Dale in the northwest. Tear's earliest history is unknown. But it has always been the home of House Dres, who was elevated into the status of Great House after a slave-raid in Thorn, orchestrated by Thalthil Dres. It is worth noting that Thorn is located across the border from Tear, in the region of Thornmarsh. In Tribunal mythology, the outskirts of Tear is where the second-known appearance of the Ruddy Man, a supposed aspect of Molag Bal. The Ruddy Man was originally defeated by Vivec, near the town of Gnisis, but ten years later, the Ruddy Man would appear, taking control of a wayward shaman of the House of Troubles. The Ruddy Man had destroyed several villages across the countryside until Vivec defeated them again, leaving the carapace with the mystics and scholars of the Number Room. A mystic would don the carapace and study it for an eternity. In 2E 572, the Dark Elves of House Dres, and by extension, Tear was inducted into the Ebonheart Pact. In 2E 850, there was a raid on a slaver camp, orchestrated by the Khajiiti crime boss, S'rathra. The Redguard hero, Cyrus was involved in the raid on the slaver camp, freeing multiple Khajiiti slaves. During the Imperial Simulacrum in the late Third Era, the city-state of Tear was ruled by King Nisath, when it had a rivalry with Mournhold. In 4E 5, the city of Tear was largely affected by the Red Year, by the shockwave that emitted from Red Mountain. Tear's southern wall had crumbled from the earthquake, and the marsh turned into mush. The land around Tear was flooding from the nearby coast and swamps. Many people were feverishly attempting to save their livestock. Many farmers were making attempts to help people caught amidst the chaos. Hundreds of people were reportedly saved from Tear's destruction. In 4E 6, the Argonians had cut a bloody swathe across southern Morrowind, in Tear's general area. Baron of Tear in Legends.